In February Rihanna launched her first original sneaker design under the Fenty x Puma label. The Trainer, as it is known, sold out fairly quickly when it debuted on Puma’s websites. To promote the slip on sneaker Rihanna shot an ad campaign with Craig McDean that was styled by Tom Van Dorpe. Here is a breakdown of some of the items she wore during the photo shoot and of course, I’ve included some links for you to purchase The Trainer if you haven’t done so already. 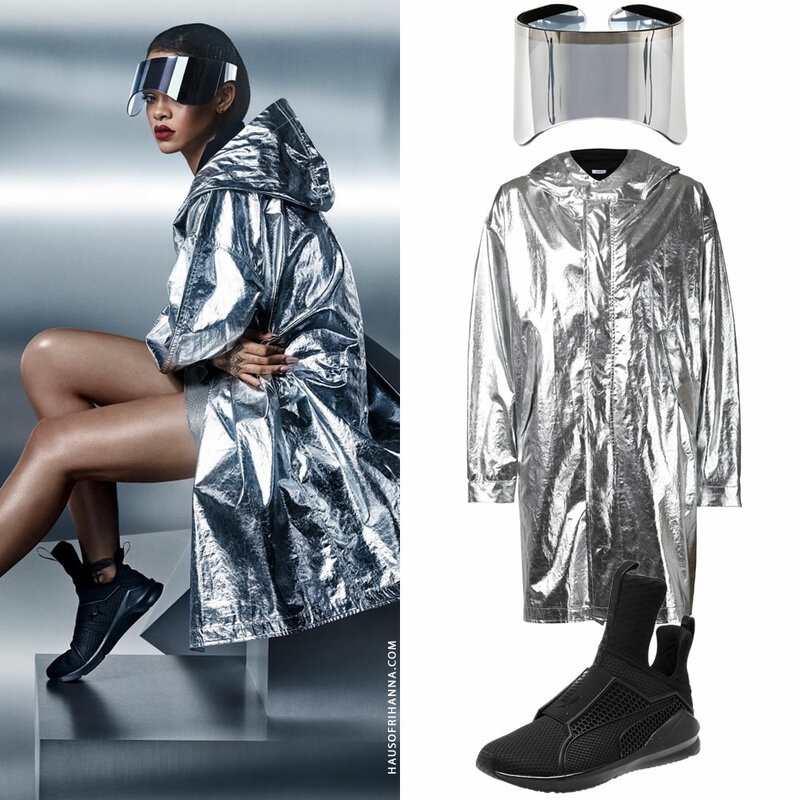 Here the pop star wore a bold mirrored visor that was the star of Alexander McQueen‘s Fall/Winter 2012 collection with a silver foil parka by Nomia. The hooded fishtail jacket has side pockets and closes with a zip and snap buttons. It’s almost sold out but a few small sizes are still available from Nomia’s online store for $380. The Trainer is a high-top pull-on sneaker with an elongated tongue. The Puma formstripe is visible at the side (and it’s reflective!) while Puma by Rihanna branding is printed down the tab at the back. You can get the sneakers in Blackout at Shiekh ($180). Next Rihanna shows off The Trainer in Whiteout. These can be purchased at Opening Ceremony and Nordstrom (women or men) for $180. She wore a long-sleeved Puma logo t-shirt and although that exact tee isn’t available, you can grab a similar sweatshirt at ASOS for $43. Layered over the t-shirt is a diamond pattern acrylic dress by accessory designer Fannie Schiavoni. Get it here for £640. Last but not least is the Red Alert version of the sneaker. Get it from Opening Ceremony for $180. In this campaign image Rihanna wore a bomber jacket from Wanda Nylon‘s Fall/Winter 2015 menswear collection. Contact the designer if you are interested in purchasing.